Congratulations to the winners of the Light/Dark Mystery Contest. Adina W. of Fair Lawn, NJ will receive Meredith Cole's Posed for Murder, and Melissa K. of Virginia Beach, VA will receive the ARC of Vi Agra Falls by Mary Daheim. In the last week, I had the chance to see two mystery authors, Betty Webb and Marion Moore Hill, so, this week, I'm giving away autographed copies of their latest books. The Anteater of Death is a departure from Webb's Lena Jones mysteries. It's a treat to read this enjoyable mystery set at the Gunn Zoo, in Gunn's Landing, CA. Teddy Bentley, the assistant zookeeper, is determined to clear the anteater of charges of murder. This marks the debut of a fun series with a terrific cast of characters. Webb's Lena Jones fans shouldn't worry, though. The next Lena Jones mystery, Desert Lost, is scheduled for December release. 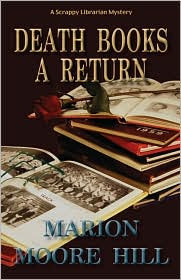 The second book in Marion Moore Hill's Scrappy Librarian series is Death Books a Return. Juanita Wills, the librarian in Wyndham, Oklahoma, is researching a local history when she stumbles on an unsolved racial crime fifty years earlier. Why did no one investigate the murder of a young black man, killed in Wyndham after sundown one night in 1959, when he shouldn't have been in town? So, which autographed mystery would you like to win, The Anteater of Death or Death Books a Return? If you'd like to win one, email me at Email me!. If that link doesn't work for you, the email address is: lholstine@yahoo.com. 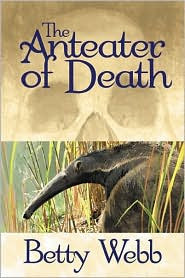 Your subject line should read either Win "The Anteater of Death" or Win "Death Books a Return". Your message should include your mailing address. Entrants only in the U.S., please. The contest will end Thursday, Feb. 26 at 6 p.m. MT. Jim will draw the winners at that time. The winners will be notified, and the books will go out in the mail on Friday. Good luck! Thank you for the ARC, Lesa. I'm so excited! I love the cover of ANTEATER. The book sounds really good. Congrats, Adina! Do you know a guy named Michael Agosta? His family's in Fair Lawn. Thanks for the congrats, Serena. Isn't that a great cover on Anteater? Poisoned Pen Press usually has terrific covers. Good luck to everybody who enters the contests! Thank you, Caite. There's always next time for the contests. Good luck! Thanks for letting me know the blog was featured on SweepsAdvantage.com. I appreciate it! Just stopping by to say I enter & to say hello! Thank you, Zestywonderland! And, I hope you have a nice day as well. Good luck!